What Did Mary Magdalene look like? Throughout the ages Mary Magdalene has been pictured in various ways, according to people’s ideas of her and the legends and traditions prevailing at the time. In some Eastern Christian churches she was pictured all in red, with an hysterical expression, and raising both arms to Heaven so she looked like some poor sort of wailing banshee creature. An eastern Icon, showing the elderly Mother Mary, a strange Mary Magdalene in red with blonde hair, and a sad St. John (Lazarus.) 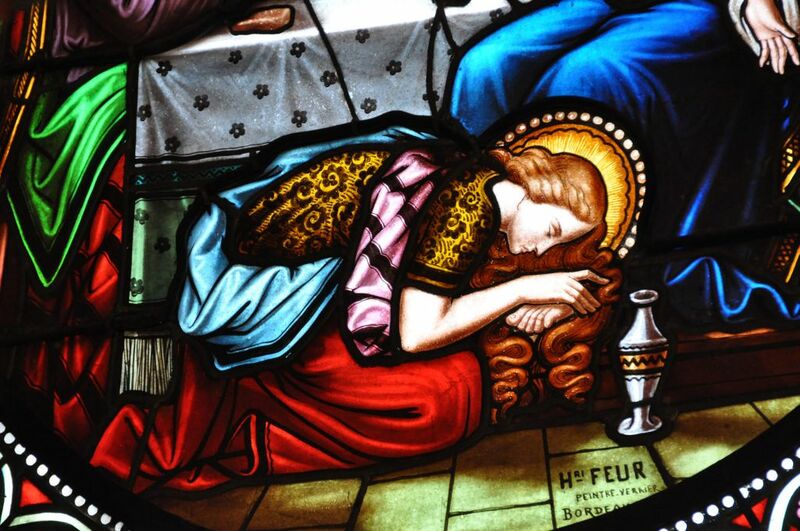 Then - Another blonde Mary M in a more conventional stained glass image, but still blonde. In “The Golden Legend” by Voragine in the late 13th century, she was described as having long golden hair. (Click here for more.) This was picked up on by many religious artists, the most classic example being the golden casing made for her so-called skull. In some pictures her head was beautiful coiffered, or braided, or her hair was wound about with jewels. This was an idea left over from the presumption that she was a wanton woman, who loved to decorate her body to attract wealthy suitors - what today one would call a high-class courtesan. 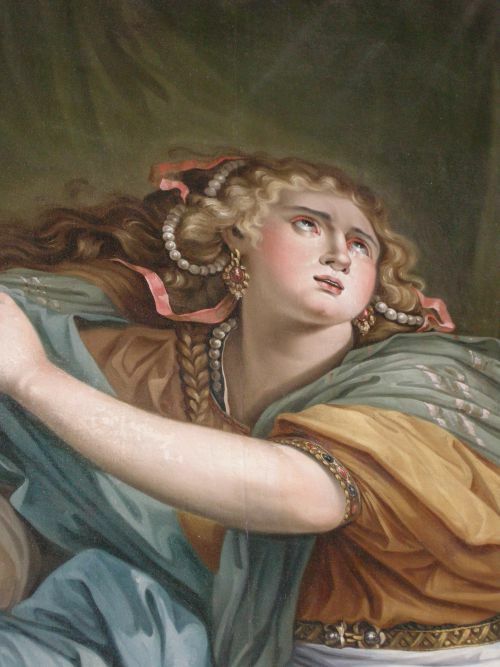 At the time that Mary Magdalene was alive, a woman’s hair was important - it was considered outrageous for a woman past puberty to go about bare-headed, without her hair hidden by a scarf. It was often a sign that a girl was reaching marriageable age, that is, she had experienced her first menstruation, when she started covering her hair, or her family made her do so. After she was married, only her husband or close family members would ever see her hair. It was, in modern parlance, “a big deal.” Hence, many images of her emphasise her long hair, even as a sorrowful mourner at the foot of the cross. Because Mary Magdalene had long hair which was visible, many modern researchers think she was condemned as a “sinner” simply because she did not cover her hair. However, in the first mention of her in the Bible, when she washed Jesus’s feet and dried them with her hair, she was at the house of her father, Simon the Pharisee. The verses in Luke 7, 44 - 47 are interesting. Jesus says to Simon, “You gave me no water for my feet, you did not welcome me with a kiss, but she has not stopped kissing my feet since I came.” It was politeness in those days to offer a guest the chance to wash his feet before entering the inner rooms of the house. Mary Magdalene did this washing act for him; it was her home for she was the daughter of Simon of Bethany; and because she was at home her hair was loose. Thus, she was a not a sinner because of her hair. Then why? She was the daughter of the house but not living with her husband. 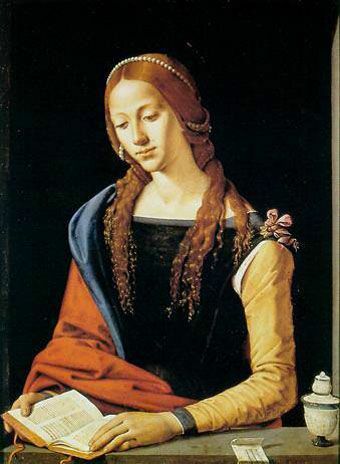 Long loose hair has always been connected with Mary Magdalene iconography. Often her hair was bright red, for modern spiritual people say red hair was a sign of royalty and Mary Magdalene was a Princess. She was often pictured dressed in red, then in red and green, and then just in green. Some experts say this was because she was connected with paganism, and they dressed her in green to show she was not holy, unlike the other Mary, Jesus’ mother, represented in ethereal blue. In the seventeenth century she was shown as someone very quiet, perhaps reading a book, often elaborately dressed and in rooms obviously for wealthy people. She was dressed as an aristocratic young lady would have been dressed. Today the iconography has solidified into the conventional characteristics of long loose hair, carrying a jar of ointment, standing by or holding a skull and a crucifix, and crossing the fingers of her hands in a particular supplicating manner. We have so many images but none imply what she actually looked like. Since 1969, when Mary Magdalene was canonised by the Church (before then she was never technically a saint) interest in her has increased. 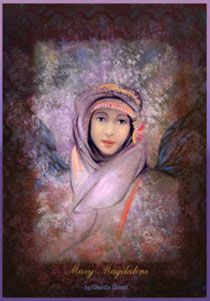 She is now immensely popular and sometimes thought of as a goddess, in the spiritual community. Some modern pictures show her as small, dainty, ethereal, blonde or strawberry blonde - not quite the feisty female of history, as I like to think of her. Spiritual people say to me that these delicate, ultra-feminine images are not supposed to be any sort of historical representation, but simply a focus for meditation. (One could of course say the same for any conventional images and statues of Mary Magdalene in Catholic churches.) But Mary Magdalene was not Caucasian. So, if we think of Mary as an historical figure, what would she have looked like? 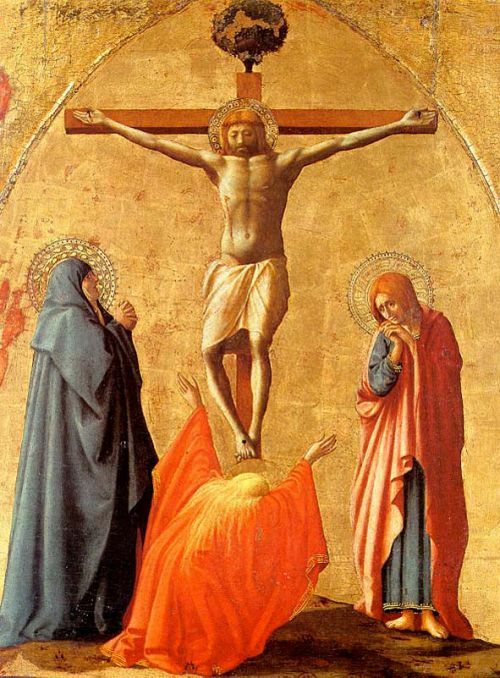 Mary Magdalene was either Jewish or Egyptian, certainly middle-Eastern, while Lynn Picknett (see our book page) thinks she was black, which connection explains the Black Virgins that one finds in the south of France. Lynn Picknett thinks Mary might have had Nubian blood, but I think she was simply Jewish, her father being the wealthy Simon the Pharisee, her mother being dead by the time Mary appears in the Bible. Almost certainly, the historical Mary Magdalene would have had dark skin and dark brown eyes with hair that could have been brown or red, but was probably black. She might well have looked like a beautiful Arab girl. The connection of Mary Magdalene with the Black Madonnas found in France, intrigued me. (Click here for more.) Could it be true that the statues had black faces because they were once modelled on Mary Magdalene, and not the Virgin Mary? There is only one of these black statues, only one, that has not ever been thought to represent the Virgin Mary. 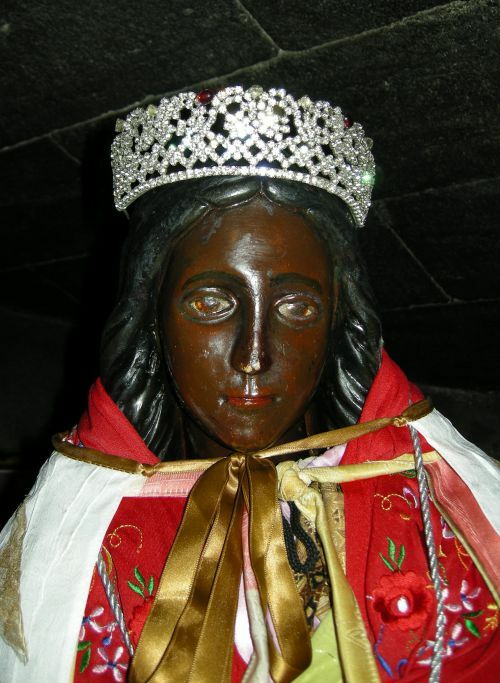 It is the statue with the dark face of Sarah, seen in the church of Stes-Maries-de-la-Mer. Sarah is reputed to be a servant of the saints Mary Jacobi and Mary Salome, or else she was a gypsy who had helped them become established when they first arrived in France. But in Judaic language, the name Sarah is not a name, it is a title, and the title means - princess. Lawrence Gardner (see our book list) discovered that Mary Magdalene had a daughter whose name was Tamar, after an earlier Tamar, a heroine in the Bible. And Mary Magdalene’s mother was an aristocrat - a princess. And so Mary’s daughter too could have held the title of Princess, or maybe they just called her Princess because they loved her. I found myself taking a leap of faith. If Mary’s daughter looked like her mother, then that statue of Sarah at Stes. 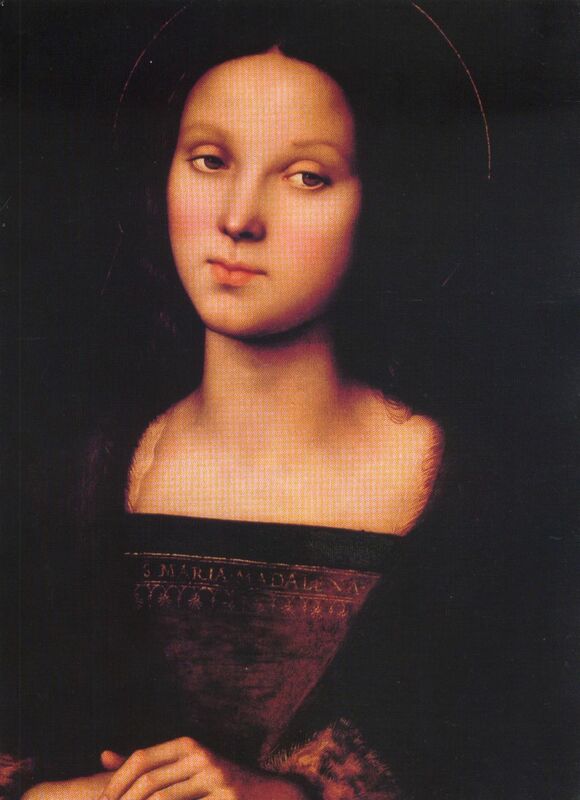 Maries de la Mer is the nearest representation possible to give us an idea of what Mary Magdalene really looked like. She had long black hair, huge dark eyes with a hint of sadness, the tiniest smile, and a diamond crown. CRUCIFIXION was not the end . 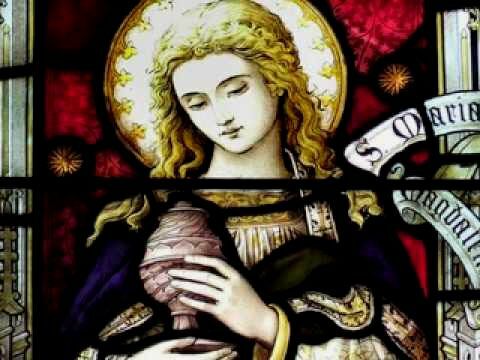 . .
MARY MAGDALENE - married to Jesus? St. SALVAYRE Mysterious . . .